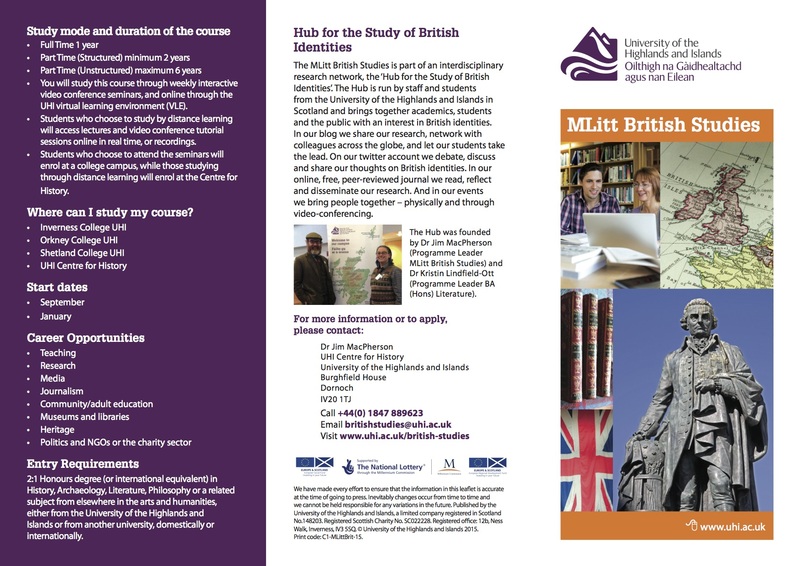 You can study British Identities with us at the University of the Highlands and Islands on a number of individual modules/short courses, or on the interdisciplinary MLitt British Studies. We also welcome enquiries from students wishing to undertake PhD research, or those interested in working with us on potential post-doc projects. You can find out more about our MLitt British Studies here. The MLitt is a one-year interdisciplinary taught Masters course. Students take 6 modules, of which four are core: “British Identities” (History), “Britain Begins” (Archaeology), “Imagining the Nation” (Literature) and “Philosophy and British Identity” (Philosophy). In addition, students undertake a substantial research project – a 15,000-word dissertation or project. The MLitt is internationally validated – this means that you can study from anywhere in the world through video-conference seminars. You can also study individual modules as short courses. We are involved in a number of modules that explore British Identities. Please get in touch if you want to find out more!